3:15am came far earlier than I had anticipated, but I was galvanized to put in a hard last shift before flying out that night. I was feeling the pressure to show my friend Chris that I actually knew how to hunt turkeys, and I believe (although he didn’t show it) that Chris was feeling the pressure to put a gobbler in front of my gun barrel. We made the trailhead in a chilly and dim pre-dawn, previously determined to make it to a clearing for an initial set up on birds that we hoped were roosted nearby. We began to make the uphill walk to the clearing, and after 300 yards or so, I stopped and got out my barred owl call. I heard a distant coyote bark just before I made a call, and then, as my owl call broke the still dawn air, I heard the sound that I had been hoping for. 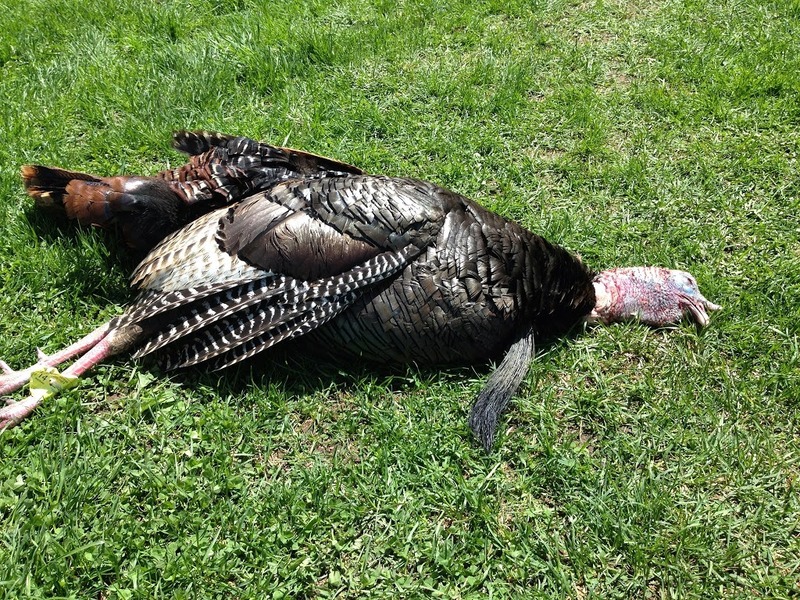 A tom gobbled, and he was inside 100 yards. I turned to Chris and gestured to him that a bird was gobbling, but he thought I was referring to the coyote. I was shocked that he hadn’t heard what I had. I owled again, and nothing responded. 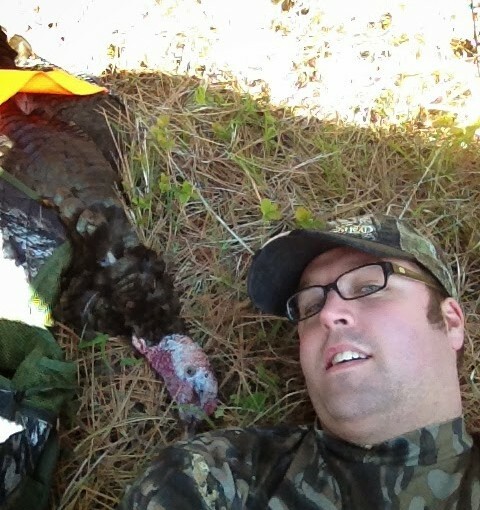 Chris was ready to move on, and I was questioning my own sanity…I was absolutely positive that I had heard a gobbling turkey. The bird gobbled again on his own, and this time I was sure Chris heard it. His eyes told me so. I’m pretty sure I was grinning like an idiot while we exchanged hand signals outlining where we wanted to set up on the bird. We resolved to move quietly back down the trail to a small clearing that had a convergence of game trails on it, where we set out my two Zink Avian X hens and got ourselves situated under some broomed out Douglas fir trees. It had been a nightmare deflating, rolling, and packing around the decoys, but I was quite pleased to have them at that very moment. Within minutes of setting the decoys out, I saw a light frost developing on their backs. In the excitement of a gobbler sounding off from the roost, I had not noticed that the air temperature was hovering in the mid-single digits. The bird gobbled steadily as we set up, and after we were comfortable I did some light calling on my box call. The bird hammered back and then really ratcheted up his gobbling. I didn’t have any trouble keeping tabs on him when he flew down, and slowly but steadily he began to make his way down towards our position. Two game trails that I could see converged on the clearing about twenty yards from my position, and as the gobbling came closer I could picture the bird coming down the left side trail, and twice I could hear him walking on the other side of a small ridge. He moved back and forth, concealed by the ridge, gobbling often. I moved slightly to get my gun in position, hopeful that by the time he could see the decoys, I could see him. If he cleared the trail, he would be in range for certain. I held the gun steady for what seemed like an eternity, and since the gobbler didn’t own a watch and presumably didn’t care about my aching, trembling arms and increasingly frozen fingertips, he made arduously slow progress towards our set up. Then I heard a deer snorting behind me. Close by. Think inside of twenty steps. I turned my head to see a doe whitetail standing in our scent column, blowing an alert over and over again. This went on for a minute or so, and the next time the turkey gobbled, he was farther away…then further still. I lowered my 870 and yelped excitedly on my pot call, throwing in some aggressive cutting. The next gobble was closer but more to my right. I shifted slightly while the bird gobbled again and again, seemingly hung up out of sight behind that blasted ridge. I still had not laid eyes on him, but I was beginning to get a feel that this was as cagey a public-land bird as I’d hunted anywhere in Ontario. He gobbled hard and kept making a racket, and keeping an ear on him wasn’t tough, but soon my worst fear was fulfilled. I heard a hen yelping near to our setup, and then I heard his gobbling change. I was certain that she was taking him away. Over and over he gobbled, each time further up the hill from where he had been just moments before. Then he went silent. He had found his hen, and gobbling just wasn’t something he was interested in doing any more. My heart sank, and I looked over to Chris. We nodded to one another before slowly gathering the decoys and strategizing our next steps. We decided to make a circle around ahead of the birds, and we dropped into a gully off the trail so we could move unseen past the birds. After moving a few hundred yards back up the trail, I blew a crow call and the turkey let one solitary gobble slip out. He was perpendicular to our position, across the trail, and well inside of forty yards. We decided that the best move was to have me crawl up onto the trail side, and hopefully yelp the bird into range with a mouth call. I silently shed my vest, decoy, and coat before beginning a slow, ten yard belly-crawl up onto the edge of the road. I poked my head around a stump and saw a turkey fifteen steps from me. It was the hen and she was oblivious to my presence. I purred and yelped aggressively and she cut me off every time. I was hoping she would come onto the road and drag the gobbler behind her. Instead she headed back further up the hill and into the woods, yelping and complaining all the way. I still had not seen the gobbler, and in the whole conversation I’d had with the hen he had not gobbled once. I was beginning to fear that he had left the area. I reverse belly-crawled back down into the gully, and we planned our next move…again. I was certain the gobbler had made for the hills, and I was thinking of making a very large loop to a spot over a mile away. Chris had similar ideas but his range was more limited; he was pitching a spot just over a few hundred yards ahead where the pine ridge that the bird had been hunkering in transitioned into a more open, meadow-like area. He knew the lay of the land and I would have been a fool to second-guess him. I’ve never moved so quietly and rapidly as I did to make the spot Chris had in mind, and we once again set out the decoys. We resolved not to call or make a sound for at least twenty minutes, and for that whole time I was cursing the turkey hunting gods. I cursed them for sending the deer by to snort at me, I cursed them for the wily old hen that had led that gobbler astray, and I even cursed them for providing the gobbler in the first place. After all, my hopes had been raised, only to be dashed cruelly. 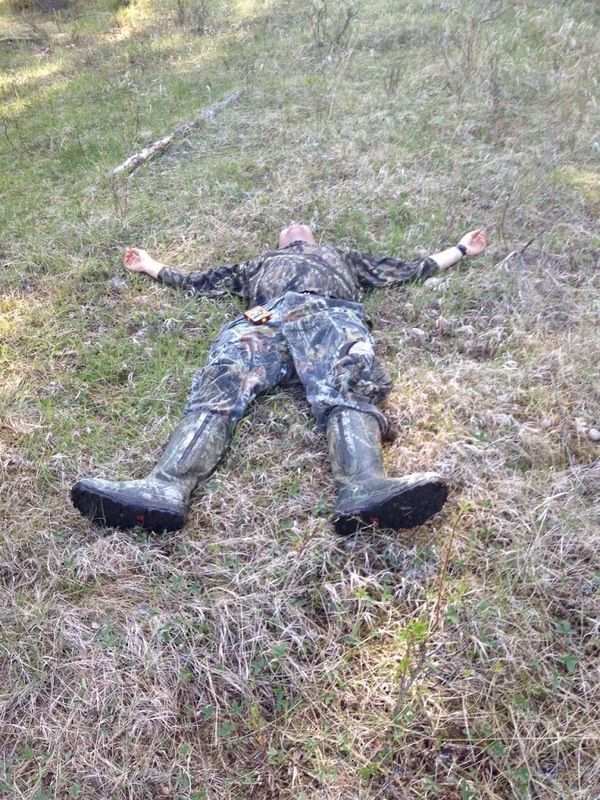 It had been a hard three days of hunting and my feet hurt, which I also blamed on the turkey hunting gods. I had temporarily forgotten about the beautiful scenery, the abundance of wild game, and the good times spent in the woods, the truck, and the kitchen with a great friend. But getting beaten by a turkey does that to a man. Almost in disinterested fashion, I yelped plainly on my pot call after twenty minutes of abject silence. 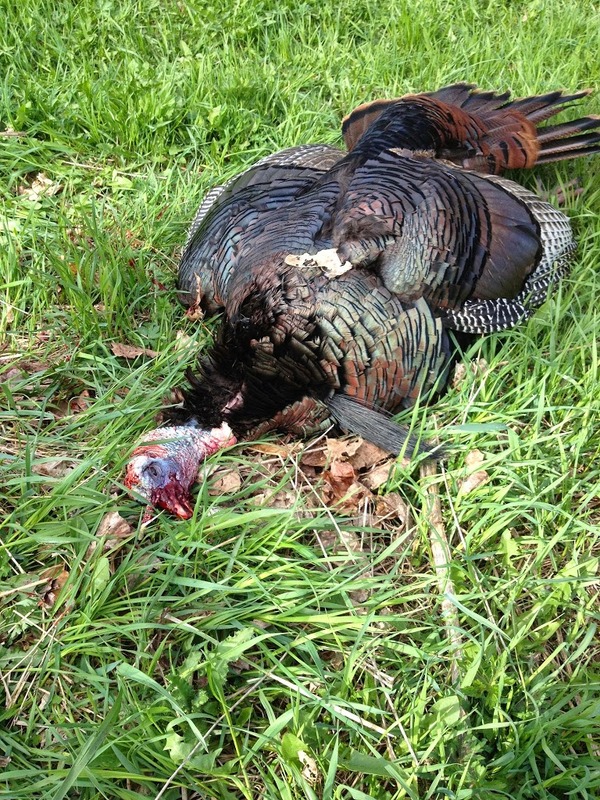 Before I finished the sequence a hammered gobble cut me off. The game was back on and the gobbler was in front of me inside of sixty yards. 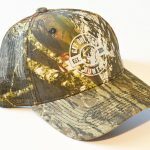 I shouldered my shotgun again, and within seconds I saw the heads of two turkeys pass quickly through an opening forty yards to my right. I turned ever so slightly to get the gun downrange on them, while the bird gobbled again unprovoked. I could see the broad tail fan of a bird that went in and out of strut, and the bright red head of the turkey began to approach one of my fake hens. I saw the bird gobble again and I began to search with my eyes for an opening that would allow me to slide in a shot. Another fir tree obscured the gobbler from my sightline, but it also meant that he could not see me. 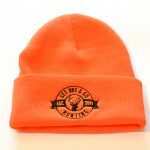 Eventually, I could see the bird’s fire-engine red head moving out from either side of the tree as he approached my decoy, and I kept the front sight on his throat as he closed the gap. Finally, at thirty steps, and with both his head, and his tail up in half-strut, I could restrain myself no longer. My shotgun barked, and the bird dropped out of sight. I stood up and made a run to an open spot (although in truth, I don’t really remember my feet touching the ground) and I saw a turkey sprinting off before getting up and flying back into the pines from whence the birds had appeared. About to swear out loud at my incompetence, I looked to my right, and there in a depression next to the tree was the still, lifeless shape of a Merriam’s gobbler. From my seated position I never would have seen him fall. “Did you get him? !” was the cry from where Chris was sitting. Apparently he couldn’t see the downed bird either. “He’s down!” was all I could shout back. I let out a whoop of joy and Chris came running over for high fives and slaps on the back. I wonder if he felt his feet touch the ground either. Seemed like the most appropriate time to take a selfie. I put my bootheel on the turkey’s neck and grabbed his feet, whereupon the gobbler lamely flogged my right shin with a wing beat or two. I was shaking like a leaf, and adrenalin hammered in my veins. I vaguely recall hearing my heart beating in my ears. If having a turkey outsmart you makes you instantly and hopelessly cynical, there’s likewise no better route to pure joy than sealing the deal on that same bird. Even though it had all happened so fast, and just minutes before, we relived the hunt (as hunters are apt to do) and we took dozens of photos. I notched my tag, and we made for the truck. I could hardly feel the weight of the bird I was in such high spirits. He was not a typical bird, and at first I thought he was a jake. He barely had spurs at all (only 1/8 of an inch on each leg) and his beard was just a 3-inch stub, but he had a full, even tail fan with the tawny, pale signature feathers of a Merriam’s gobbler. On closer inspection, the beard was rotted and frayed at the end, and my suspicion was that it had frozen or otherwise been broken off (a sentiment echoed by all my turkey hunting brethren when they saw it). 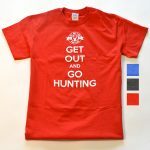 But I wasn’t on that trip to shoot a monster longbeard, or a sharp-spurred limbhanger. 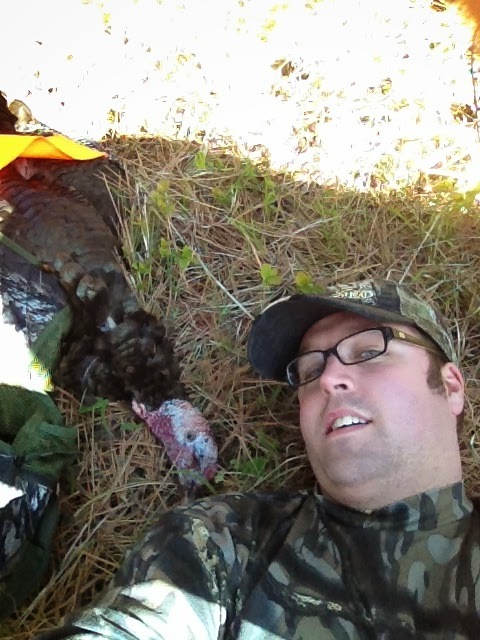 I was there to take on a Merriam’s gobbler on his own turf, and with the help of my friend, I had succeeded. I pride myself on being eloquent and articulate, but in those moments (and to be fair even still, a whole month later) I didn’t have adequate words to describe the feelings. I was exhausted, elated, and on the brink of crying tears of joy. This was a bird I’d wanted to hunt for a long time, and the only other subspecies of wild turkey other than Eastern that lives in the cavernous expanse of wilderness that makes up Canada. I could say now that I’d achieved a turkey hunting goal, and that Chris and I had done it with our hodgepodge mix of local savvy, woodsmanship, and turkey hunting experience respectively. We’d persistently hunted some pretty tough country, and we’d made good decisions (especially that morning) that ultimately brought the game to hand. I was proud of myself, but I was really happy for Chris. 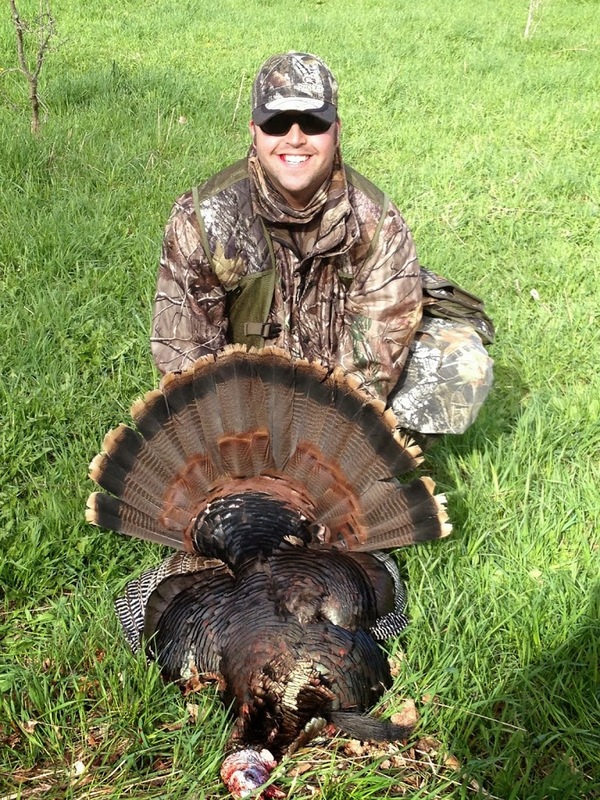 He had never hunted turkeys before, and I hoped that I had made a convert of him. 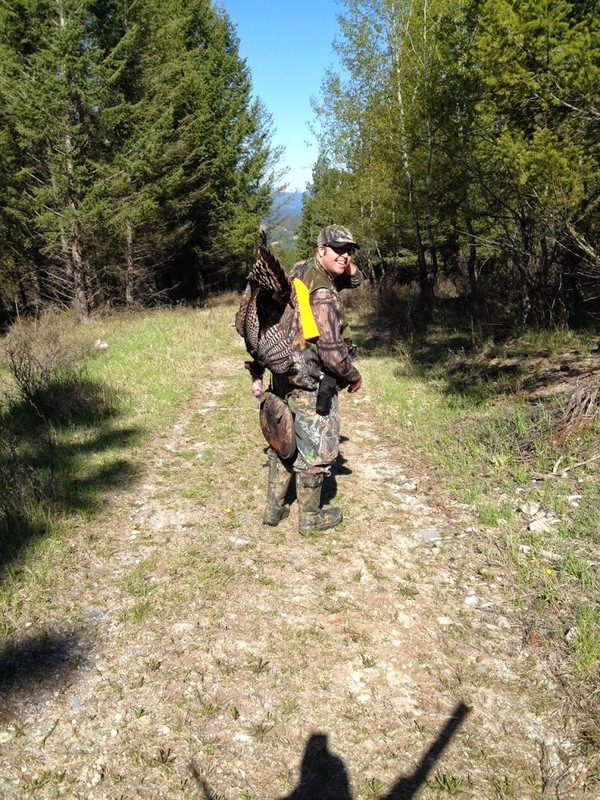 The bird, for his part, certainly provided a compelling case for the excitement and rollercoaster of emotions that a successful turkey hunt can bring. We honored his sacrifice by eating him a mere seven hours later. In the back of my mind, I knew I’d have to get back to work eventually, and I knew that my wife and kids would be happy to see me. 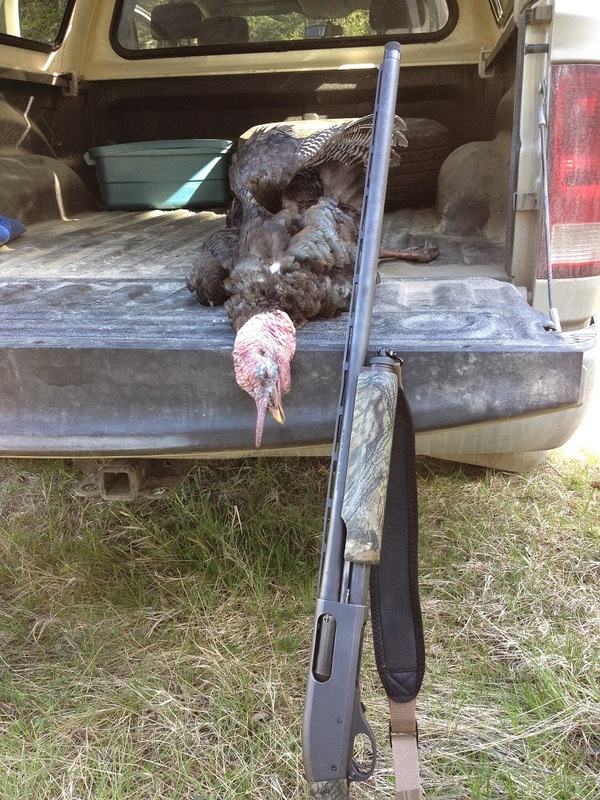 I also knew that I still had at least three more weeks of turkey hunting to do in Ontario. But as we sat in the sun in Chris’s front yard, cold cider in hand, and our bellies full of wild rice, wild turkey, and carrots I could not help but feel completely at peace with the world. 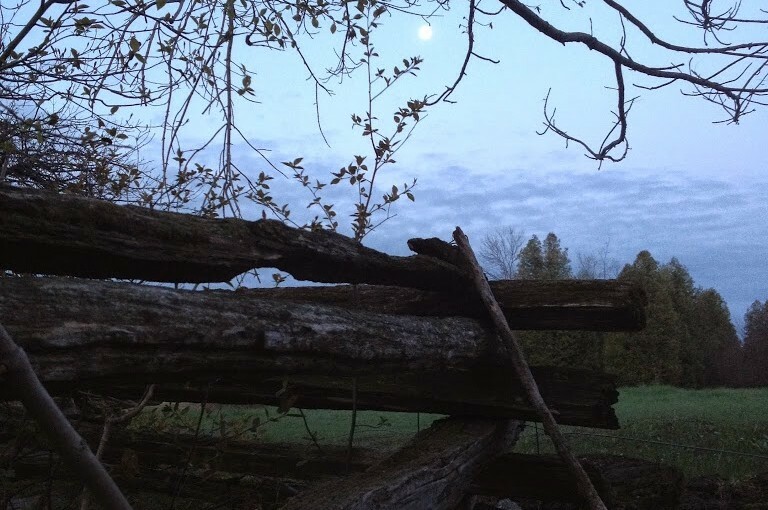 The stresses of work were several provinces away, the afterglow of a successful hunt surrounded us, and we were in arguably the most beautiful countryside in the nation. We talked about Chris making the next year’s trip to Ontario for an Eastern turkey hunt, and I can say that it sounded like a pretty damn good idea. There was nothing that could break the good vibes that afternoon. The plan had been to get up earlier than we had the previous day, but even then arising at 4:15am put us to our parking spot with too much daylight to make an unnoticed entry to the woods. Luckily a dense fog draped over the area and we geared up and stalked our way in. Every now and then we paused and I blew out the tell-tale notes of the barred owl. We began to move through mixed stands of aspen and pine, with open meadows interspersed throughout. Chris led the way often, as he was familiar with the property, and at one point he suddenly stopped short. In grizzly bear country, when your guide freezes up, you pay attention. But this was no bear. Rather, the dark form of a cow elk began to emerge slowly from the fog, her silhouette ghostly in the gloaming pre-dawn fog. She was alone and apparently unalarmed by our presence in her woods. After briefly sizing up our shapes, she calmly ambled away to our left, her form being re-enveloped by the fog as she departed. For a second I was fairly certain I had just hallucinated the entire encounter, but Chris turned around with a broad grin on his face. “Pretty cool, eh?” was all he said. I had to agree that it was. We discussed our next plan, and Chris suggested an open field that was nestled at the bottom of a flat ridgeline and across a stream. Not being one to argue with local knowledge I bade him to press onward; and I was soon faced with a daunting chunk of landscape. It seems that in order to access the previously mentioned field, a hunter had to scale down an incline that was, to put it euphemistically “steep”. Think winding one track game trail with a downward slope of around 65 degrees. Now make it scraggly and stretch it out for two hundred yards or so. Add to that mud. That’s what my ankles had to look forward to at 5:55am on a Sunday. Chris mentioned that this was the fastest way down, but he also cheered me by mentioning that the return journey would not be via the same route. And with that, like a mountain goat, Chris was rapidly down the singletrack nightmare, while my descent, while not comical, was not precisely rapid either. I made it to the bottom with ankles, knees, and collarbones intact, so I considered it a success. The bottom of this cliff (for lack of a better word) a wide field shrouded in mist greeted us. Chris motioned to a bridge across a creek (a bridge he built by the way) and we made for the crossing. As we approached we both noticed that forty or fifty elk were bedded down just across the bridge, and to get to our intended location, we were going to have to get past them. Neither one of relished a climb up to higher ground, and the elk obliged us by moving quietly away. Several times we were within seventy-five steps of them, and never once did they break into anything more than a walk as they moved away from us. For a moment it seemed like Chris and I were just another part of the wilderness landscape, with game indifferent to our presence. We made for a small copse of aspens next to a watering hole, and we placed the decoys out in front of us. 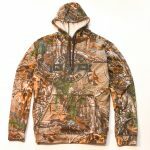 The mist was so thick that all of my gear was becoming damp, and when I pulled my slate call from my vest, the surface instantly bore condensation on it. So much for that call, I thought. Luckily my box call was waterproof and I let a string of yelps pierce the fog. Nothing answered. A pair of Canada geese noisily lifted off the water hole behind us, and circled the field, landing two hundred yards from our decoys before proceeding to feed on the wet grass. The silence was periodically punctuated by clucks and honks from those two geese, but otherwise the silence was perpetual. In time the geese began to get quite excited, and their honks and growls escalated in volume enough to draw my attention; it was then I noticed the large and very healthy looking coyote that was trotting towards them. He made no attempt to stalk the geese and as he continued on across the field he also trotted close by the group of elk that we had encountered first thing in the morning. He disappeared over a hill in the field and although we saw him twice more, he really did not cause any trouble to anyone. In time we decided to move on to another spot; heading for the mountains again with the hopes of working through a large piece of public land adjacent to our set up from Saturday. We encountered more elk and white-tailed deer as we arrived, but the weather looked to be on our side as the earlier mist had lifted and we were greeted by blue sky and sunshine. A light breeze had developed, but nothing that would discomfort us in our hike through the area. We set up initially for about an hour, but hearing nothing we opted to move through the forest, prospecting for turkeys, and watching out for sign. We encountered no turkeys, but the wilderness was in full ‘display mode’ for this flatland dwelling Ontarian. We came across more elk and deer sign than I thought was imaginably possible, and the highlight of the afternoon was finding an open meadow rife with wild morels. I harvested about three dozen of them, and though I’ve seen morels in the past, never had I seen them in such abundance. After making a long circuitous hike that was punctuated by several stunning vistas and more than a few uphill slogs, we opted to finish the day back where we had ended the previous afternoon. It was, after all our only stop that had yielded any consistent turkey sign and also the only place where we’d heard a gobble. 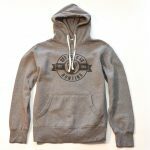 Arriving at the trailhead under a beaming sun, I shed a layer of clothes in the truck before even venturing out, and I was pleased that I did. Thirty minutes into the hike and we stopped for a water break which was more than necessary, even though I was down to the bare essentials of shirt, pants, socks, boots, hat and vest. As we stood quietly looking around, movement caught my eye to my left about fifteen steps away. An unformed gray shape was moving slowly through low brush, and I initially dismissed it as a rabbit. I glanced again and as the shape cleared the shadows of low trees, I realized that it was the head of a hen turkey, the rest of her body was hidden by a low mound. She did not alarm putt, and she did not sprint away, but rather she purposefully and directly headed up a steep ridge to my left. I looked in vain for an accompanying gobbler, and within moments she had disappeared from sight. Frustrated at this chance and all too brief encounter, but buoyed by actually spotting the animal I had come to hunt, Chris and I resolved to put in a sit at a bend in the trail a few hundred yards up the road. 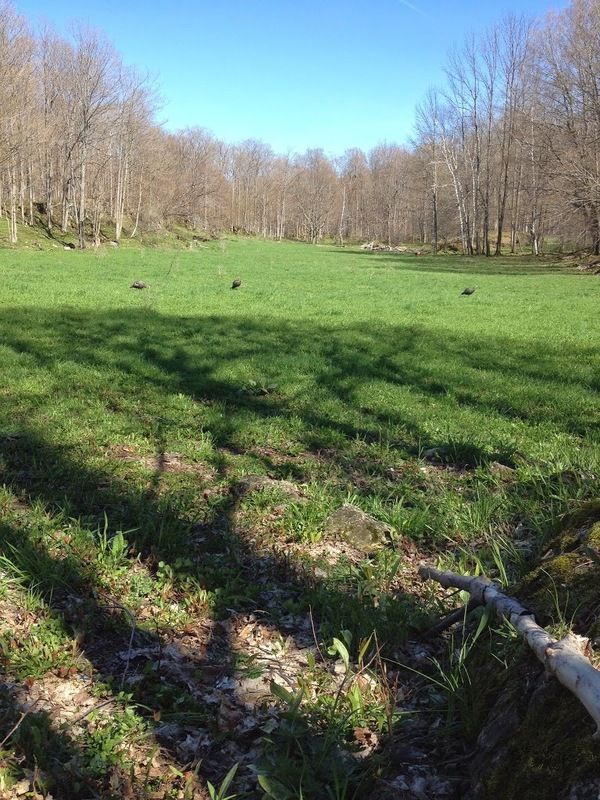 We again placed decoys, concealed ourselves at the foot of some trees, and I went to attempting to call in a gobbler. After ninety minutes of silence and stillness, voices up the trail prompted us to backtrack to a picturesque seasonal pond, where we again did some prospecting and calling. With no success there, we made for an even more remote clearing with a pond, in a place where Chris mentioned he had harvested his first deer. Curious to see the place and having no other option but to keep pressing on, we made the move, but not until after we took a few photos of the spot. The pictures capture the essence of the whole trip perfectly; a clear sunny afternoon in a stand of greenery, while snow-capped mountain peaks and a silent pond stand as the backdrop. For our own part, Chris and I stand together wearing smiles that are far too wide for our respective faces. It is pretty obvious that we’re having fun, in spite of the turkeys playing stingy with us. 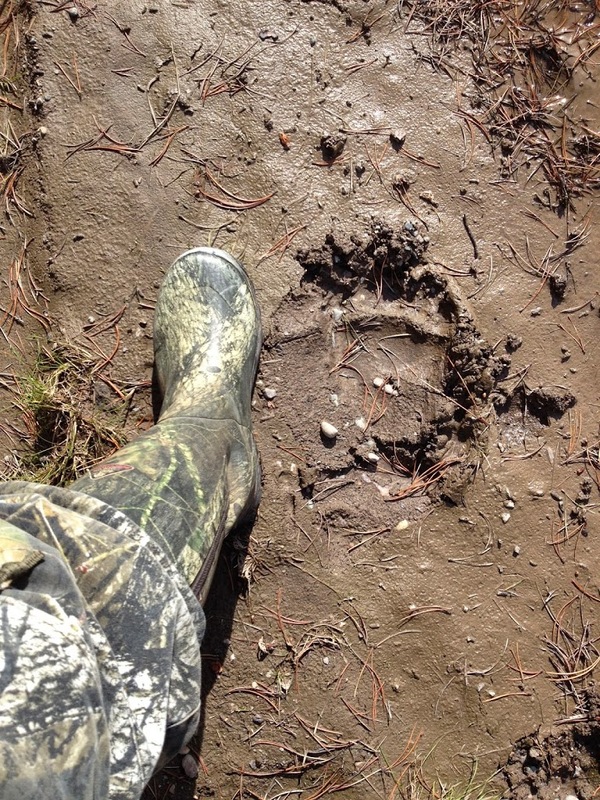 On our walk to what would be the final stand of our day, we crossed a muddy flat, and came across the fairly fresh, large and unmistakable track of a large bear. I photographed the print, and put my size 12 left boot alongside it for scale. The track was essentially the length of my foot, and we would later identify the track in a field guide as that of a grizzly bear. 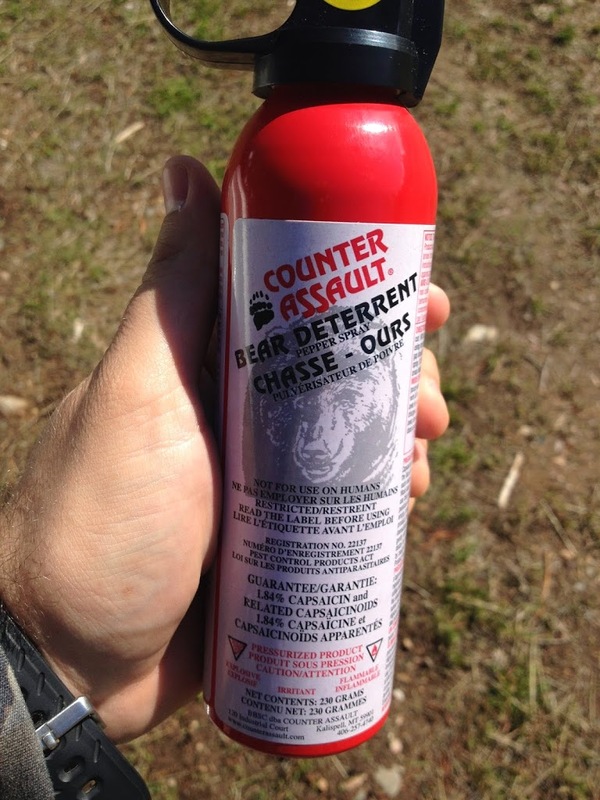 To say I was a little more comforted by the can of bear mace at my right side would have been an understatement. The next kilometer or so of hiking was filled with Chris recounting the stories of the five or six people he knows who had themselves been mauled or had had loved ones involved in bear maulings. Chris knows how to put a man’s guard at ease. We made the final clearing with the sun descending low on its ecliptic, and to be honest my heart was a bit out of it. We had to that point of the day put in over thirteen hours of hiking and travel, and the fleeting hen aside, we had little to corroborate the statement that Merriam’s turkeys did in fact live in that region of British Columbia. I was hungry and in need of a beer, and although he wouldn’t say it, I felt that maybe there was some pressure building on my friend. Eventually we headed for the truck, and my feet were throbbing from all the ground covered that day. I had never anticipated an easy go of this trip, and I was getting just what I had guessed. That evening I cleaned up the morels before frying them in butter, salt, pepper, and lemon juice. This was accompanied by wild rice, honey-glazed carrots, and some jalapeno-cheddar sausages made from last fall’s venison. A cold local beer found my stomach, and my stomach was glad for that. We were down to our last card in the deck, and we decided to go all in on the spot we had just left. No place else had held recent turkey sign, so we planned to get up the earliest we could and prospect the morning with locator calls, before settling into the pattern of alternately prospecting and sitting over decoys. It was our best shot. I boarded the Beechcraft 1900 with some level of trepidation. I fly a lot in my career, but never in a plane so small. Another first for my aviation experiences was when Air Canada removed one of the passengers and re-routed them to another flight for “weight and balance precautions”. I was glad I hadn’t had that chocolate chip cookie with my lunch. I was tucked into seat 1A, meaning that I was directly behind the pilot; I could see every instrument and dial, and his view out the front windscreen was the same as my view out the front windscreen. The plane rose sharply off the tarmac in Calgary, where I had just completed an hour’s layover. We broke into a cloudy sky and bore slightly to the south west. 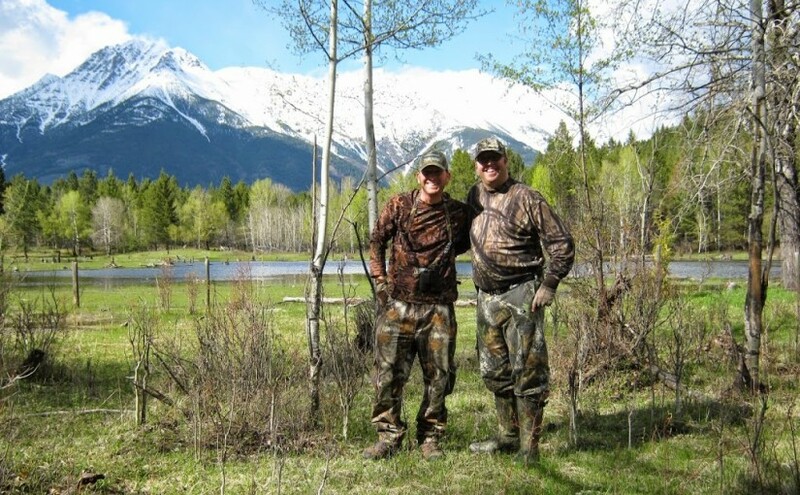 I was headed for Cranbrook (YCR for all you airport code junkies out there) where my childhood friend Chris Bosman was waiting to pick me up and guide me around on a four day mountain hunting trip for Merriam’s turkeys. Forty five minutes later, we broke out below the clouds and I watched our descent from the second-best seat in the plane. Within ten minutes of landing, my shotgun and suitcase came along the luggage conveyor and we bundled all the gear into Chris’s truck before scampering down a rainy highway towards his house. After unpacking and scarfing back a short lunch, we headed for one of several Crown land areas near Jaffray, BC. These expanses of wilderness ranged between approximately 3600 and 5000 feet in elevation, and they redefined the meaning of the word ‘rugged’ for this flatland-dwelling, lifelong Ontarian. Having only about four hours to hunt on that first afternoon, our first stop was a large block of woodland adjacent to a privately owned ranch, with the plan being to prospect along through the field edges and game trails (of which I would see hundreds in that four day trip) in the hopes of triggering a response from a turkey. 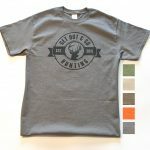 Although we saw fifteen deer and a pile of elk, turkey sign, and notably any turkey calls, were lacking. I was jet-lagged from my all-day series of flights and layovers, and by the time the sun was setting I was leg-weary from the winding climbs and descents of this landscape that I had never before encountered. But the views and the abundance of game had me exhilarated and after a quick dinner I hit the hay. 4:30 in the morning came a lot faster than I had anticipated, but I was keyed up to hit an area that, on Google Earth at least, looked promising. It was in area of Crown land about forty-five minutes from the our home base that housed a series of lakes and uplands, with some sustained climbs overlooking clearings that would be ideal for glassing and cold calling. This was the area that Chris had seen the most turkey sign in during his pre-trip scouting, so we got in in the dawn to make a setup with two Avian-X hens. Another parked truck greeted us on the drive in, but we pulled off a different road and headed upwards, unfortunately spooking several white-tailed deer as we went along quietly. On a sidebar, I have never in my whole life seen as many white-tailed deer as I saw on that four day trip. Once we were set up in the fairly open understory, we started calling. 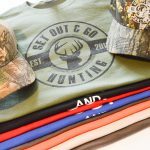 After twenty minutes, I heard movement behind me to my left, and turning my head ever so slightly that way I was surprised to see five or six whitetails cautiously feeding their way into our decoy set up. Eventually one got into our scent column and the group bolted but it was exhilarating to have that much wild game in such close proximity. After another forty minutes or so, we packed up the decoys and made towards a valley field. In that area we found our first set of promising sign in the form of turkey droppings, a few tracks, and a dusting area. We headed up a hill and stopped for a morning snack; I laid back and drank in the mountain scenery, spring sunshine, and cool mountain breezes. This trip was a much needed respite in a period of pressure and career stress. Although the climb had tightened my legs and lower back, my shoulders and soul were loosened by the quiet skies and craggy grandeur of the area. When we resumed the climb, we headed up and made for a high ridge that was overlooking a series of small lakes and swampy areas. We set up again at 10:00am, and just as I sat down (and without any prompting from my turkey calls) a gobbler sounded off in the valley below us. We sat down quietly and I started working my slate call, hoping to draw the bird uphill. Chris heard him once more behind us, but still down in the valley. Eventually the bird moved off and we were left to ponder what happened. But some days turkey hunting is just like that. We moved down off the rocky bench and into the bottom from which we had recently heard the bird, cautiously moving along in utter silence. As he passed under a fir tree, Chris’s pack caught on a dead branch and it broke off with a loud snap. Immediately to my left and at less than twenty yards, a head popped up unexpectedly, but it was not the head of any game animal, but rather the unmasked head of another hunter. He gestured a greeting as Chris and I walked over to have a brief chat with him. He was there from Alberta and he was with a local friend of his and they were out after turkeys with their compound bows. They had not heard the gobbling that we had, but they had only been on the spot for forty minutes, and they admitted that most of those forty minutes were spent having a late-morning nap. As it turns out, these were the only other hunters we would encounter in the four days we hunted. I want to raise a couple of points now. First off, I was secretly pleased with how slowly and quietly we were moving through the bush, as anyone who knows me as a hunter is probably aware that silent stalking is not always my strong suit. But that we were unwittingly able to stalk up on two other hunters (albeit sleepy ones) gave me some satisfaction. Secondly, I’d like to point out that we were hunting in the literally hundreds of thousands of acres of Crown land in the area. That we ran into any other hunters is coincidence enough, that the local friend of the Alberta hunter was a known acquaintance (a fella named Aidan, I believe) of my guide/friend is even more unbelievable. Talk about a small world. After a ten minute chat with our fellow hunters, we said our ‘good luck’ farewells before Chris and I continued up into an even higher region, with the plan being to eat lunch and glass some ridgelines, before dropping down onto another series of small lakes and ponds. Mother Nature, though, had other ideas. As we ate our packed lunches, the breeze took a distinctly frosty turn and whipped up into a low howl. Looking northeast, we could see dirty weather coming over a snow-capped ridge top, and in a matter of seconds, pea-sized hail began to ping off my hat and sting my ungloved hands. I slipped my heavier jacket on and tucked my face down in my chest, while more ice pellets strafed the back of my neck and slipped down the back of my shirt, finding their final resting place in the crack of my behind. Chris pulled on a windbreaker and threw a warm hooded sweater over that. With no sign of the precipitation letting up, we shared a knowing glance and made for the truck. On the way out the hail subsided, and as we kicked up another dozen deer or so and found a few more turkey tracks in the roadway we thought perhaps we were vacating the situation too early. However, we got into the truck just moments before the rain showed up and started teeming down in waves of wind-driven misery. Back at the home I caught a much needed hot shower and fell into bed for what I thought was going to be a short siesta. Almost three hours later, I came to. Feeling awful for sleeping the afternoon away, I was relieved to hear that the rain had not let up and that the afternoon was essentially rained out. Sunshine was the order of the day for the rest of the trip, so over a venison dinner (and with a few local brews thrown in for fun) Chris and I surmised a plan to hunt a new area the next morning on a property owned by Chris’s former employer, The Nature Trust of British Columbia. A pine and aspen forest on an upland bench overlooking a floodplain was the dominant feature of the area, but it was not until the next morning that I would find out how dominant it was. We chatted about family and life for a while before I shuffled off to bed, not frustrated, but not as blindly optimistic as I had been before the trip. 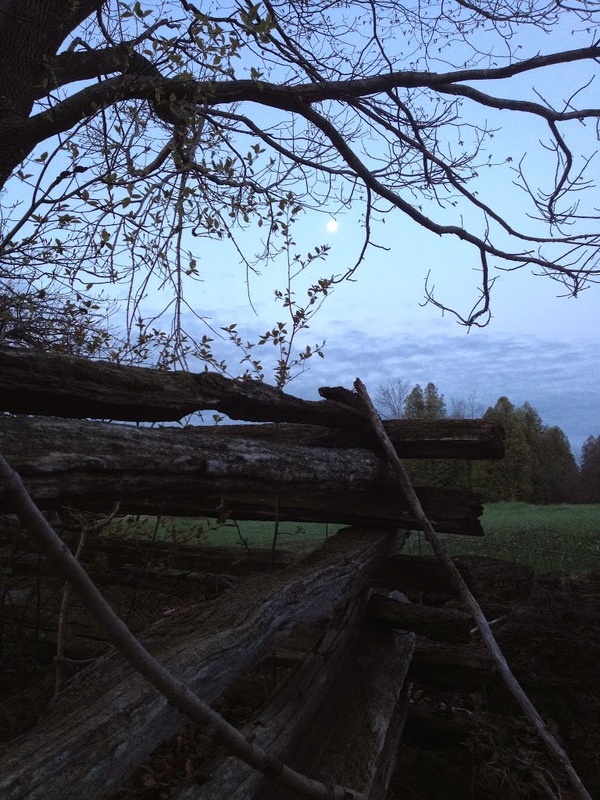 One lesson had been taught in those first two days, and that was that my lifetime of languid hunting in the simple fields and gently rolling woodlands of southern Ontario had made me woefully unprepared in environmental, physical and tactical terms, for the rigors of a DIY public land hunt in the Purcell Mountain range. My unhealthy relationship with barbecue and whiskey probably wasn’t helping things either. One fact was certain though and that was that things were going to get harder before they were going to get easier. With sunny weather forecast for Sunday and Monday, our plan was to stay out and hunt all of both remaining days. My legs were already complaining at this rigorous climbing and hiking over varied terrain, and Chris was quite blunt that there was going to be a lot more effort to come in the next few days. I was scared and exhilarated simultaneously and as I drifted off to sleep, I pictured the various scenarios that could play out in the remaining two days. Even in my dreams though, I could not have predicted the events of the Sunday and Monday hunts.